Dopamine receptors have been found in certain populations of non-neuronal cells in the brain, viz., discrete areas of ciliated ependyma and the ependymal cells of the choroid plexus. 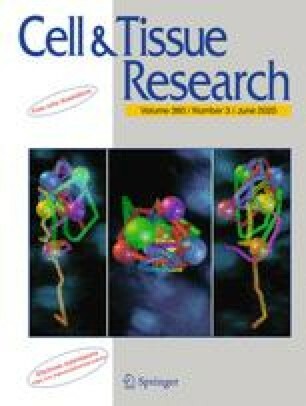 We have studied the presence of both tyrosine-hydroxylase-immunoreactive nerve fibers and dopamine receptors in the subcommissural organ (SCO), an ependymal brain gland that is located in the roof of the third ventricle and that secretes, into the cerebrospinal fluid, glycoproteins that aggregate to form Reissner’s fiber (RF). Antibodies against D2, D3, D4, and D5 dopamine receptors were used in immunoblots of bovine striatum, fresh SCO, and organ-cultured SCO, and in immunocytochemistry of the bovine, rat, and mouse SCO. Only a few tyrosine-hydroxylase fibers appeared to reach the SCO. However, virtually all the secretory ependymal and hypendymal cells of the SCO immunoreacted with antibodies against D2, D4, and D5 receptors, with the last-mentioned rendering the strongest reaction, especially at the ventricular cell pole of the secretory ependymocytes, suggesting that dopamine might reach the SCO via the cerebrospinal fluid. The antibodies against the four subtypes of receptors revealed corresponding bands in immunoblots of striatum and fresh SCO. Although the cultured SCO displayed dopamine receptors, dopamine had no apparent effect on the expression of the SCO-spondin gene/protein or on the release of RF-glycoproteins (SCO-spondin included) by SCO explants, suggesting that dopamine affects the function(s) of the SCO differently from the secretion of RF-glycoproteins. The authors are grateful to Dr. A. de la Calle and his collaborators, Dr. Z. Khan, Dr. A. Gutiérrez, and Dr. R. Martín, from the Department of Cell Biology, University of Málaga for the gift of the polyclonal antibodies against dopamine receptors. We also wish to thank to E. Moreira for her help with the immunostaining of frozen sections.